Ian Smith understands that disability inclusion doesn’t mean much if you can’t get in the door. As a wheelchair user and Deaf software engineer, Ian has had to ask for physical access into his workplaces, companies that, while aware of ADA requirements, had never put them into practice or considered what may be needed beyond the basics. Whereas in academia there is typically some kind of structure in place for students and faculty to ask for accommodations, the private sector can be wildly structure-less says Ian, an MIT grad, who majored in linguistics. Many companies have simply never faced accessibility requests before. In addition to their day jobs, people with disabilities are often tasked with the uncompensated labor of providing HR advice to get their workplaces up to code, and as a minority, serve as a representative of all disabled folks. On top of tech’s fast-paced productivity standards, working with HR to take charge of one’s access needs can be draining. Ian has overseen workplace requests of door openers and accessible entrances - projects that can drag on for months. Getting compliance needs fulfilled is especially hard if you’re brand new at a company and you don’t have any social capital, Ian says. In tech’s near future, Ian would like to see basic access information disclosed on employers websites, a topic on which Ian has done some advocacy. While many offices buildings claim they are ADA compliant, many co-worker meetups happen inside other office spaces that are not covered. At PlanGrid, Ian is happy with his role as an engineer as well as with the ability he has to manage his own time. With a flexible work schedule, Ian can avoid rush hour at BART, (very useful as a wheelchair user) as well as go to medical appointments. In the office, Ian says that it had been challenging to have coworkers become accustomed to his deafness, from how group meetings are conducted to how they simply grab his attention. He uses spoken English and lip reading in smaller work meetings groups and uses a language interpreter in large groups and presentations he chooses himself through an interpreter hiring bidding system. 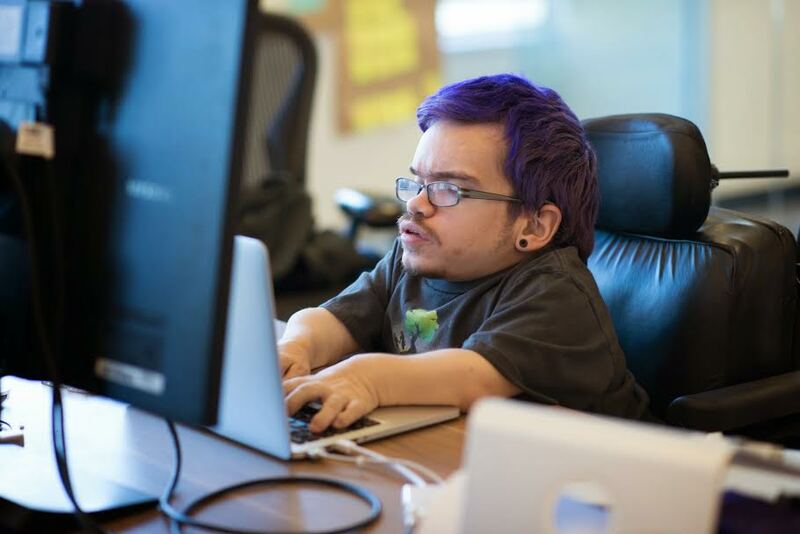 Do his disabilities serve as strength to his software creation team? Not really, says Ian, who believes that people with disabilities are too often treated as tokenized figures of inspiration. Ian doesn’t believe his identity as a Deaf, wheelchair user on a team that creates construction software matters, but having a workforce that comes from a variety of backgrounds and experiences is beneficial to overall production and idea making. Along with his position at PlanGrid, Ian is also a co-founder for Project Alloy, a new, three-person-headed nonprofit that tackles tech inclusivity through sponsoring underrepresented techies early in their careers, including those with disabilities, to attend conferences. Conferences are important profession building hubs and networking sites, but they are often expensive, says Ian. Through grants, people who have less access to these spaces will be able to have their voice and ideas at the table. We at Students for Access very much agree with Ian’s hope for the tech industry to move beyond “Disability 101.” For more stimulating conversations, check out our other featured profiles of disabled people working and thriving in tech, coming to the blog in the coming weeks! Additionally, on Tuesday, August 22nd, from 2-3:30 pm PST the Students for Access will be hosting a free webinar "Beyond Diversity 101: Learning from the Perspectives of People with Disabilities in Tech." To join us, please RSVP. Captioning will be provided.